Review posted February 28, 2009. Philomel Books, New York, 2007. 105 pages. The title of this book explains the content, but doesn’t grasp the beauty. 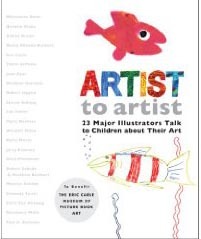 In Artist to Artist, 23 geniuses of picture book illustration, such as Eric Carle, Maurice Sendak, Chris Van Allsburg, Steven Kellogg, Rosemary Wells, Jerry Pinkney, and so many more, speak to aspiring artists about how they became an artist and what inspires them. Each artist includes a self-portrait, a picture of themselves as a child, examples of early art, published art, and a look at the process of creating art, as well as a picture of their studios. (I love the mess in Eric Carle’s—If you think about it, you’d realize that someone who deals with cut paper illustrations would have a mess of scraps on the floor.) My favorite self-portrait is the one created by pop-up artists Robert Sabuda and Matthew Reinhart—an amazingly intricate robot reaches out to embrace the reader, with the two happy artists inside the robot at the controls. I found myself popping it out again and again. Beautiful and inspiring, this is wonderful reading for someone like me—an adult with no artistic aspirations. I can only imagine how much it could be enjoyed by someone in its intended audience—a budding artist ready to strive for greatness.